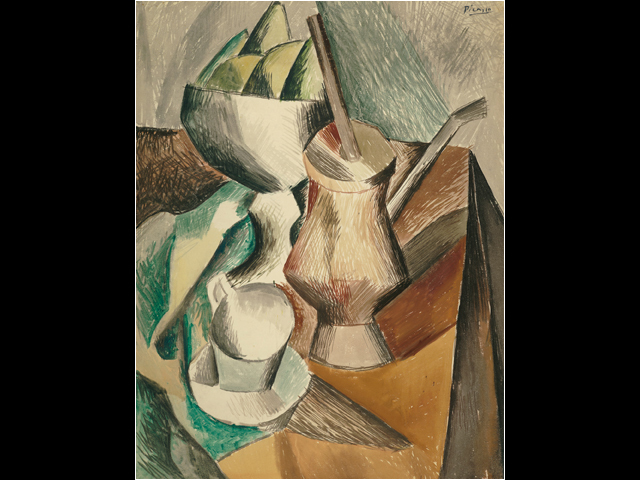 Picasso, “Still Life With Chocolate Pot” (1909) – Rethink. [Picasso] doesn’t seem so much to reinvent tradition, in the words of the show’s title, as to simply explode it, without ever losing track of the constituent pieces, which he combines and recombines in stunning ways. He does odd things with his mediums, for example, applying watercolor and gouache with a dry brush in thin, scratchy lines, as in the early Cubist “Still Life With Chocolate Pot,” creating an odd tactility that infuses his forms with light. It resembles a landscape seen from above on which light falls down. The white extending from the cup and saucer to the bowl may be a river, beach or tides. Folds of cloth or bright patches of reflected light hold blues and darks. The browns, grays and maroon of the chocolate pot and table establish something more structured. Is it a ground of sorts? The shape of the pot is vaguely feminine; straighter lines on the right side of the painting make one think of adjoining walls. Most striking: the bowl of fruit completely cut off by the sundial-like head of the pot. It is as if that is an axle twisting the angles of perspective. Perhaps light alone creates landscapes. Our artifice, even simply cups or pots, prevents us from seeing that easily. A further distortion may be necessary. An empty cup holds much of the light. Actually, considering my dislike for both still life and Picasso, I kind of like this. And maybe there’s something wrong with my perception, but I see something more than just vaguely feminine in the pot. Picasso was so prolific there is most likely at least one work there for everyone to like. I’ve got an early print of his sketches of pigs – really love it! I don’t really get stuff like this. the thing that interest me is the weird table shape…WhY? I def. like some of Picasso’s work but this isn’t it for sure. Reflecting on Picasso’s stylistic development, I can’t help but relate it to the business of producing content for the web. You simply can’t be prolific, as a writer, and keep the quality of the work as high as you might like. I feel that much the same is true of Picasso’s work. It is somewhat paradoxical that the art establishment took to his cubist work. As an amazingly talented artist, I wonder how he genuinely felt about producing some of those images.